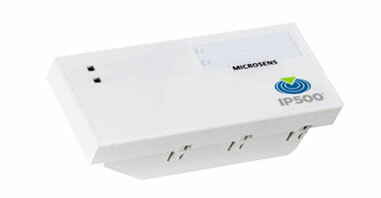 The MICROSENS IP500®-Ethernet Gateway is designed to interface IP500®-based wireless sensor networks to MICROSENS Smart Building System solutions. The compact gateway module can be directly attached to a MICROSENS Micro Switch downlink port. In order to simplify IT Service Management processes the IP500®-Ethernet Gateway consists of separate LEDs for monitoring the availability of DC on-board voltage and the internal system heart-beat. During recording and root cause analysis of incidents the status of these LEDs enables a Service Desk Analyst to easily classify issues which may be related to the provisioning of power or the system status.